Whether you're looking for immune defense supplements or the best supplement for joint pain, simply shop online with American BioSciences. Click now! 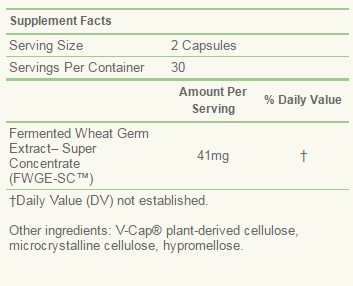 METATROL IS FERMENTED WHEAT GERM EXTRACT – SUPER CONCENTRATE! Medical researchers have long known that stress and injury can alter cell metabolism and weaken immune system regulation, leading to serious health complications. Nobel Prize laureate, Dr. Albert Szent-Gyorgyi, published research in the 1980s showing that compounds found in very minute quantities in wheat germ could help restore healthy cell metabolic function. * Fermented Wheat Germ Extract (FWGE) was created when a process was developed to concentrate these compounds by fermenting wheat germ with baker’s yeast. Now you can experience the benefits of fermented wheat germ extract for yourself as one of the best natural supplements on the market! How it is different from AvéULTRA® or other FWGE products? Non-active molecules dilute FWGE bioactives, and include gluten and gliadin, which may contribute to unwanted inflammation. SUPER-CONCENTRATED—Just two capsules have the same active ingredients as one packet of AvéULTRA! MUCH EASIER & CONVENIENT TO TAKE—No more mixing! GLUTEN-FREE—For people with gluten allergies! TAKE ANY TIME OF DAY—Before, during or after meals, with or without other medications and supplements! NO REFRIGERATION NEEDED—Heat stable up to 122°F! SAME PRICE AS AvéULTRA—No price increase, but all the additional benefits! 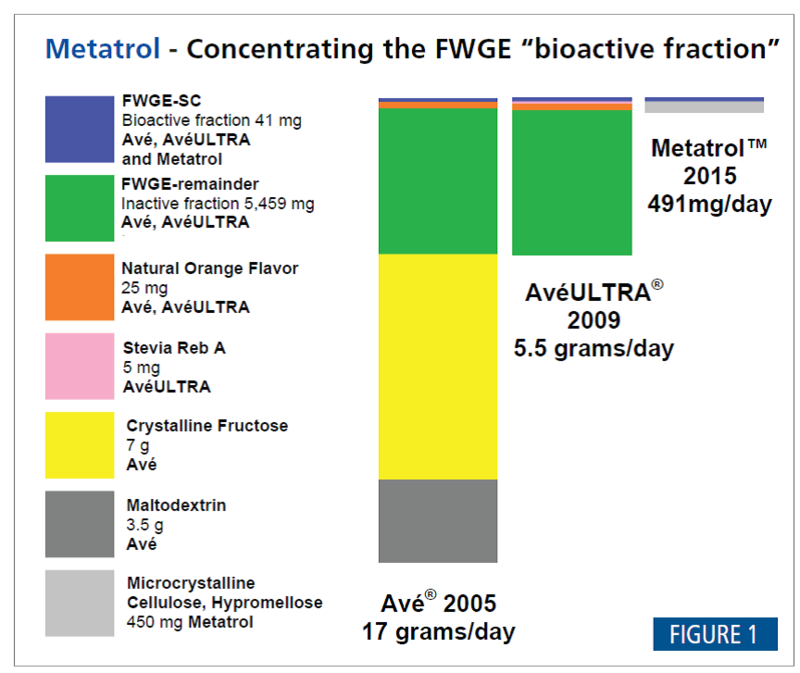 Metatrol: Finally, the FWGE for everyone. Everything you want and need in FWGE; nothing you don’t! As a dietary supplement for adults less than 200 lbs., take 2 Metatrol capsules per day (before, during or after meals, as preferred). For people weighing over 200 lbs., 4 Metatrol capsules per day are recommended to get the proper dose of FWGE. When should I take Metatrol? Metatrol can be taken any time of day, before, during or after meals. You can take both capsules at once or split them up, one in the a.m. and one in the p.m. Also, there has been no research showing that other dietary supplements will interfere with Metatrol or conversely, that it interferes with any other dietary supplements, so you can take Metatrol whenever it is convenient. When taking any prescription medication, review the “FDA packet insert” available with every drug for warnings and contraindications, and consult with your doctors or with pharmacists. We encourage everyone with serious health issues to consult with a physician for personal guidance. KEEP OUT OF REACH OF CHILDREN. Should not be taken during pregnancy or while nursing. Consult with a healthcare professional for recommended usage levels for children and guidance on using more than four Metatrol capsules per day. Do not consume Metatrol if you are taking immune suppressive medication. This product is manufactured with wheat germ and baker’s yeast. Use cautiously if sensitive to these ingredients. Gluten and gliaden are removed, so that this product is gluten-free. 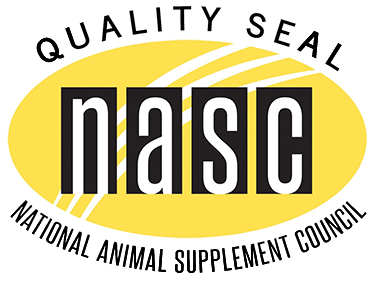 This product is not intended to be the sole source of nutrients in the diet. This product is not affected by temperatures under 122° F (50° C). Best if stored in a dry place at temperatures less than 80° F (26 °C).